This paper presents a new approach to addressing a persistent source of uncertainty in the ensemble of earth system model projections: the quantification of the warming or cooling caused by aerosols including dust, sulfate, soot, and sea-salt. Unlike previous approaches in which idealized aerosols are imposed on each model that may or may not be relevant to a particular model, this work allows each model to be run natively, but then asks each model to report all of the fields necessary to compare aerosol warming/cooling against accurate benchmark calculations. This paper addresses a persistent source of disagreement among climate models regarding both the sign and magnitude of aerosol warming/cooling, which has remain unsettled across the last two assessment reports of the IPCC. The native model error diagnostics, shown here, present a conceptual advance that can pinpoint the sources of error that are relevant for model-specific debugging and can narrow the range of model uncertainty from aerosol effects. Both the sign and magnitude of aerosol radiative forcing have yet to be settled in the multi-model ensembles that report to successive Assessment Reports by the IPCC. This persistent issue greatly complicates the analysis of earth system feedbacks, because the model results represent a convolution of uncertain forcings and uncertain feedbacks. This work directly addresses the former issue as part of the Radiative Forcing Model Intercomparison Project (RFMIP). This work presents a new set of detailed diagnostics wherein models run traditional experiments (e.g., historical, representative concentration pathways, etc.) and then report a detailed set of fields that form the inputs to benchmark radiative transfer calculations. These diagnostics enable the determination of model-specific errors, and we present proof-of-principle calculations with two different earth system models to show that the nature of their aerosol forcing errors are highly dissimilar. 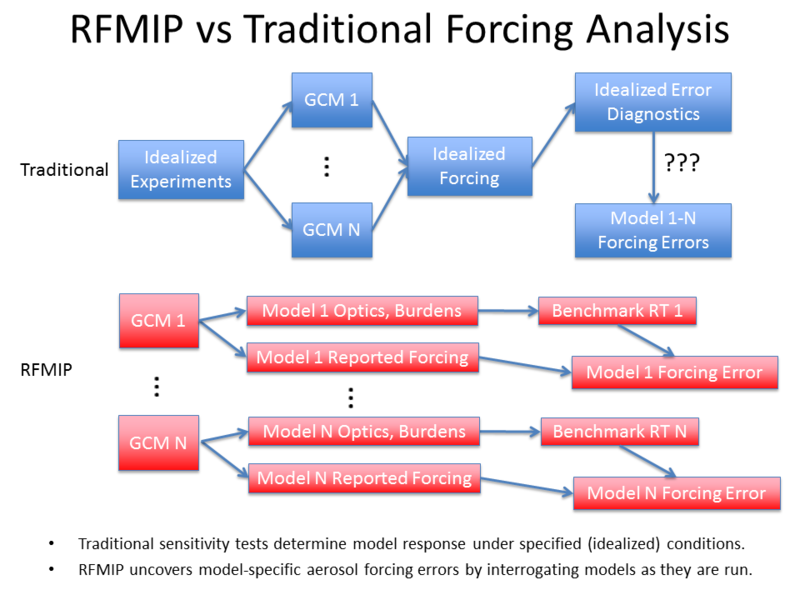 Widespread participation in RFMIP will thus uncover model errors and work to enforce uniform forcing across future multi-model intercomparisons. Jones, AL, DR Feldman, S Freidenreich, D Paynter, V Ramaswamy, WD Collins, and R Pincus. 2017. "A New Paradigm for Diagnosing Contributions to Model Aerosol Forcing Error." doi:10.1002/2017GL075933.